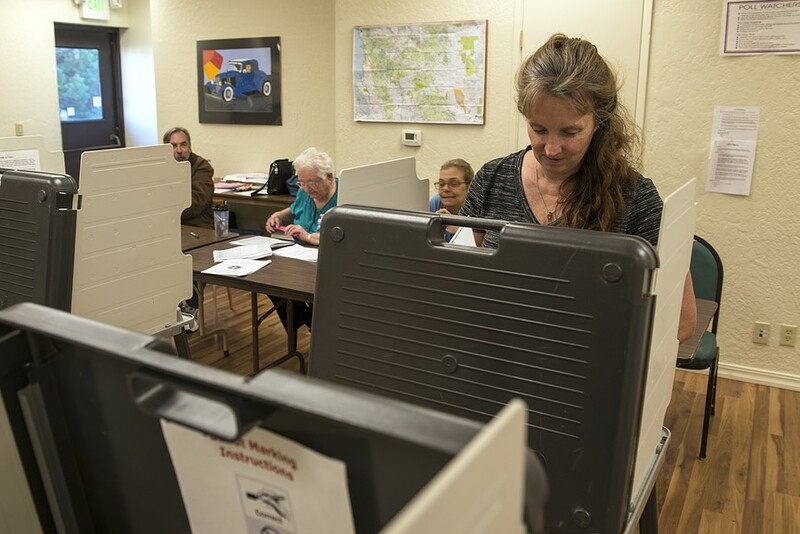 Kelly Erben casts her ballot at a local precinct, which turned out to be pretty lonely places on Election Day. The Humboldt County Board of Supervisors certified the county’s election results this morning, making official what’s long been known: Harbor District incumbents Pat Higgins and Greg Dale have each won four more years on the board. In the final tally, 23.28 percent — 13,897 — of Humboldt’s registered voters cast ballots in the election. If that number sounds dismally low, consider two things: If you consider eligible voters — not just those registered — the turnout drops to 13.77 percent; that’s actually better than at some points in the recent past. Of the last 12 November elections, this year’s turnout is actually better than that of four others: 2003, 3007, 2011 and 2013, which had the lowest turnout in recent memory with 21.71 percent. Nationally, voter turnouts have been trending downward, with pundits positing a host of possible explanations: voter apathy, voter fatigue, the economy and a disconnect between everyday lives and partisan politics. While the numbers haven’t been crunched nationally for this month’s election, an analysis of last year’s midterm election found voter turnout to be at a 72-year low, with only six states seeing more than half their registered voters cast ballots. Nationwide, voter turnout averaged 37 percent, according to a study by the Boston-based Nonprofit Vote. To register to vote in Humboldt County, click here. For the county’s newly certified election results, click here.